Here is another intriguing twist to this story of Comleroy! Many of the stock passing through the cattle yards at Comleroy in the Hunter, from as far as Queensland, were destined for the Meatworks at Riverstone. Riverstone Meatworks was founded by Benjamin Richards in 1878. In 1893 Benjamin Richards built an imposing two storey Victorian house in Windsor Street, Richmond. Although the house was unfortunately demolished in 1956, its imposing gates are still a well-known Richmond landmark. 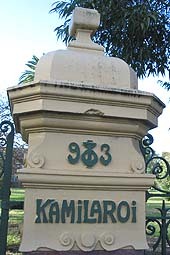 These gates in Richmond have 'Kamilaroi 1893 - B R' inscribed on them, causing some people to think that the name 'Kamilaroi' must have an early connection with the Hawkesbury area. However, the name 'Kamilaroi' did not originally come from the Hawkesbury area. Richards actually named this grand house, 'Kamilaroi', after his favourite racehorse. Ref: J Barkley & M Nichols (1994) Hawkesbury 1974-1994, Hawkesbury City Council, p124. 'Kamilaroi' was originally the name of a group of Aboriginal people from the Hunter region. This name would have also had associations for Richards because he owned extensive land near Comleroy in the Hunter Valley. 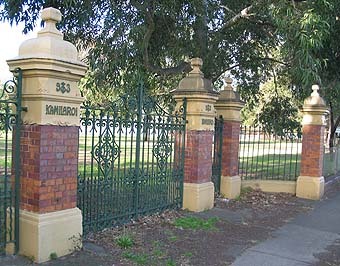 The grand gates of Benjamin Richards' Kamilaroi, now on the site of Richmond Public School. © 2005. comleroyroad.com . All Rights Reserved. A site on the history of Comleroy Road.